A couple weeks ago I had a cooking demo for a Ladies Day Event and the one item that got the most attention was….The Potato. The flipping Poe-Tah-Toe! Ok, these aren’t your plain Jane potato. This is a HASSELBACK! I just shouted that at you. For some reason every time I say hasselback to myself I’m shouting it in my head! HASSELBACK! HASSELBACK! Gosh, I have a headache. Ok, I’m going to reveal a disgusting food combo; I eat my cottage cheese with BBQ sauce on it! I know, it’s strange! But, I can’t “quit” this combo. I’ve even got my older son eating his cottage cheese this way now! And I think my sister Becky eats it this way too! Try it! Tell me some of your “closet food” combos! I won’t judge you, I will probably say, “eww” like you just did to me! Alright, onto this delicious potato. I really do like making this starchy side-dish. 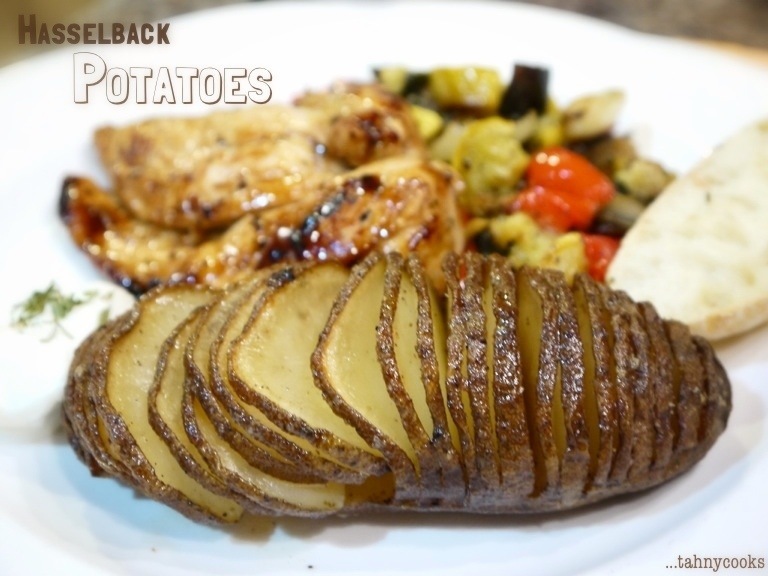 It’s a different way to prepare the potato then always whipping them up into mashed, scalloped, or just a plain baked potato. 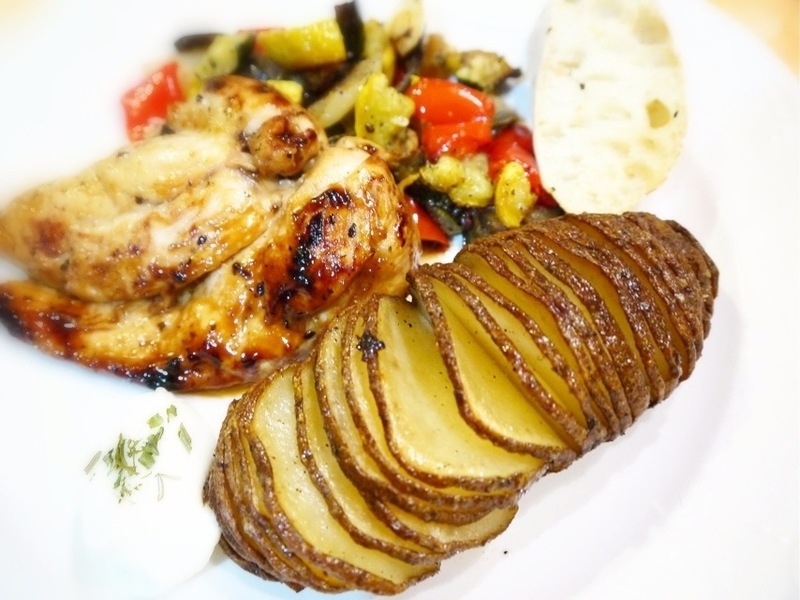 Hey, now don’t get me wrong, I love the potato prepared in all these ways listed, I’m just saying this is a fun, interesting, delicious and different method that impresses company and family. Grab a cutting board and start. 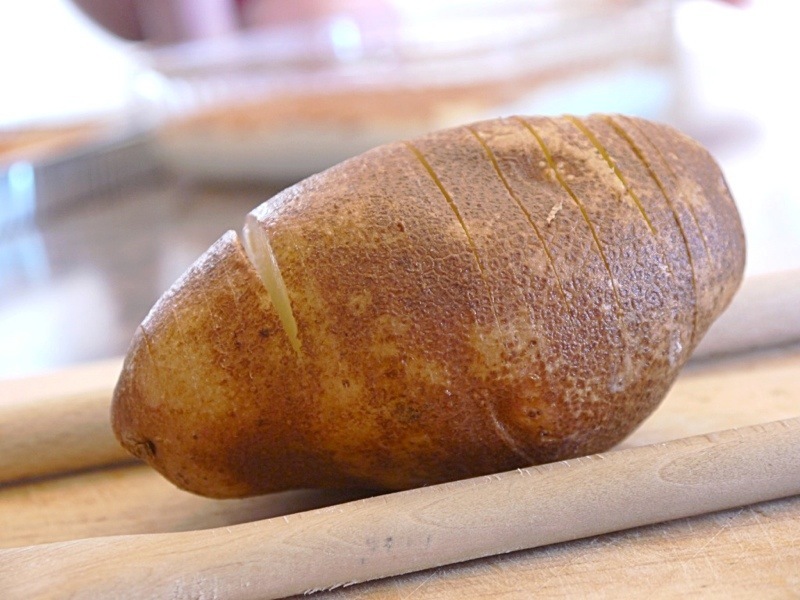 After you have the slices completed to the end of the potato, you can run it under water flexing the slices to remove some of the starch that can prevent the slices to fan open. Bake for 45-50 minutes basting every 10-15 minutes throughout. 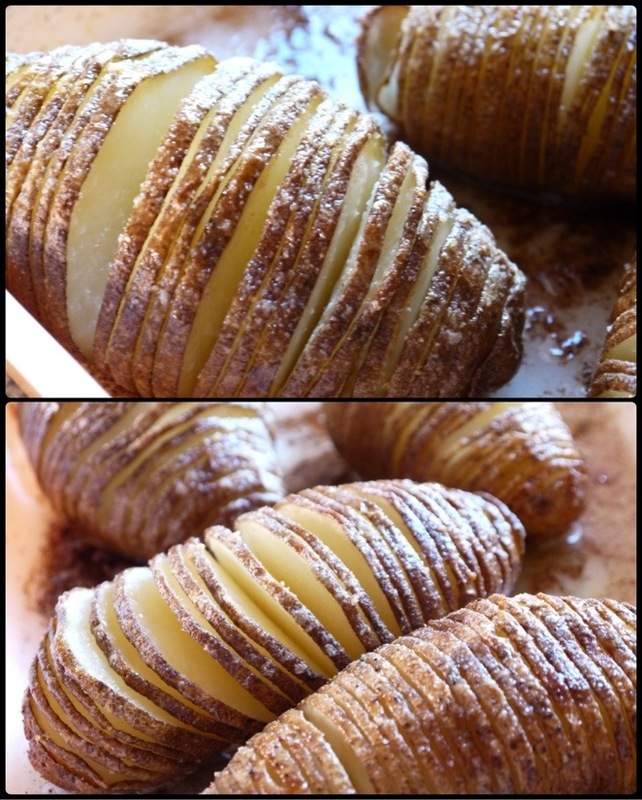 Once the potato skin is nice and crispy, and the center is soft & buttery they’re done! Serve with sour cream or French onion dip and eat like chips! Yum-o! Clean potatoes. 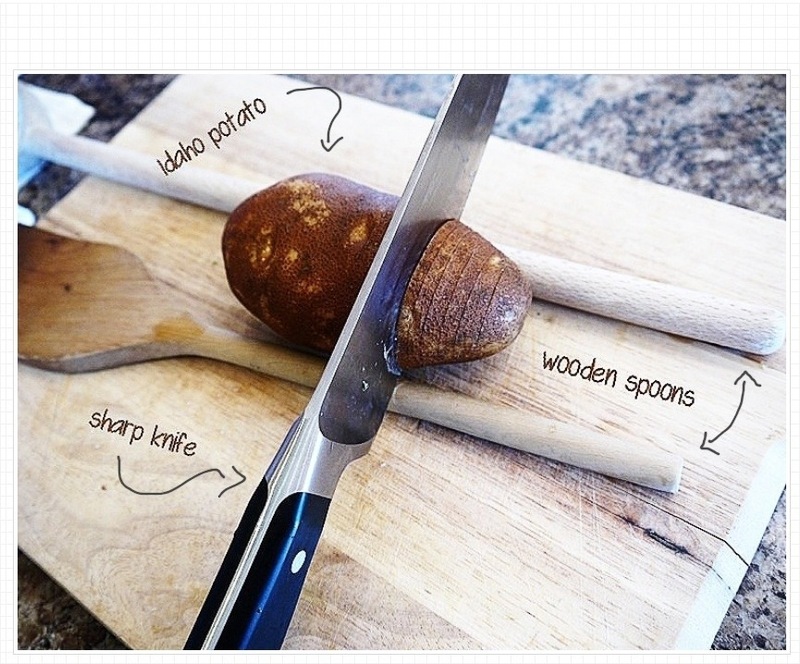 Place a potato between two wooden spoon handles. Cut slits almost all the way in, the wooden spoons will help prevent the cut from going all the way through. Rinse in cold water. 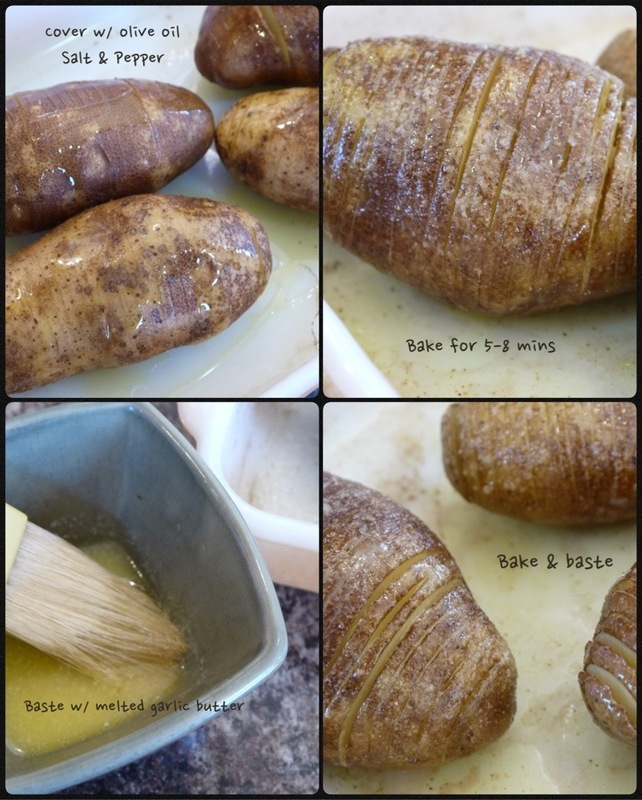 Dry each potato before applying the olive oil and seasonings. Bake at 425°F for 45-50 minutes, basting every 10 minutes with the melted butter. MAKE SURE YOU GET BETWEEN EACH CUT! …OH! Fresh chives on top of your potato would of really set it over the top! David favorite food is : it’s piece of toast with peanut butter on it, fried egg, sliced cheese another piece of toast with peanut butter on it, another egg with a piece of cheese on it and then butter poured over the top of all that. Cant wait to try this! Looks delicious! Yes, I do love BBQ sauce on my cottage cheese another one I get weird looks for is ketchup on my mac and cheese….yum, sooo yummy! I made that the other day. Yummy!! That yuck was towards my sister with beckys comments, not u Tahny.